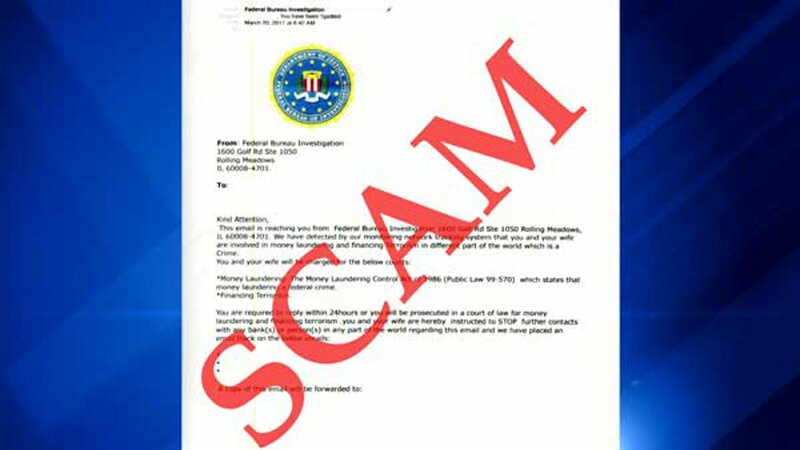 CHICAGO -- The FBI's Chicago office is warning the public after an elderly north suburban couple lost thousands of dollars in an email scam. The couple received an email appearing to be from the FBI and claiming the couple was involved in money laundering and financial terrorism, according to FBI spokesman Garrett Croon. The email demanded the couple reply within 24 hours or be charged with the crimes. The couple lost thousands of dollars in the scam, Croon said. The FBI will not send members of the public an email stating they are charging you with a crime, and the FBI will not ask the public for money, Croon said. Anyone who gets a suspicious email is asked to report it to IC3.GOV, an FBI-controlled website where the public can report cyber crimes.